A lady in her mid 50’s presents to the podiatry clinic complaining of pain in the heel of her right foot of approximately 7 months, and informs the sports podiatrist that her condition is acute. She feels dreadful pain when her foot hits the ground in the morning and she hobbles for the first few minutes of her day. After her shower, she is able to walk a little more easily but throughout the day the dull ache and throbbing is apparent. She informs the sports podiatrist that if she has been seated for a period of 10 minutes or more, she then feels excruciating pain as she starts to walk. When she goes to bed at night and lies down flat, she is aware of heat and a mild throbbing in her heel. It does not wake her from her sleep, but the pain is also causing her to limp if she get’s out of bed in the middle of the night. This patient informs the podiatrist that she has heel pain regardless of the shoes she wears, but does feel more pain when using ballet flats or softer shoes that flex easily. She usually enjoys long walks of a weekend and has been reluctant to stop, as this her favourite type of activity that her and her husband both love to do. She informs the sports podiatrist that once she is warmed up and has walked more than a kilometre she feels ok, and is able to complete the walk. However, after approximately 30 minutes, the heat and sharp pain returns. Following the walk, for the next few hours she feels dreadful pain and is forced to elevate her foot, and apply an ice pack. Before seeing the sports podiatrist, this patient went to see her GP who was unable to help. He informed her that the condition is one that gets better of its own accord, but can take up to 18 months. He advised her to take medication to reduce the inflammation, but these did not help. In anger, she resorted to internet searches and purchased a night splint. She informed the sports podiatrist that this was a painful exercise that would cause her to wake in the night, around 2am. She would be forced to remove the splint as it was too painful to endure. However, the pain first thing of a morning was a little easier and so she continued in this fashion for several weeks, before giving up. She then found some stretching techniques on line and performed these in the morning before work, and in the evening, before bed. She would stand on a step, facing the staircase, and allow her heel to drop down off the step. She informed the podiatrist that this would give short term / immediate relief, but only for a few minutes (this is common in patient’s with heel pain). However, after a week or so of performing these stretches, she found that her condition regressed. The pain became much worse than it had been. The patient stopped these stretches. Finally, this lady was advised by a friend to strap her feet using sports tape. Her husband assisted and she found mild relief. She would change the tape every few days and upon arrival at the clinic, advised the sports podiatrist that she had been strapping her foot for nearly 4 weeks. The strapping was removed and the sports podiatrist carried out a detailed physical assessment of both feet. 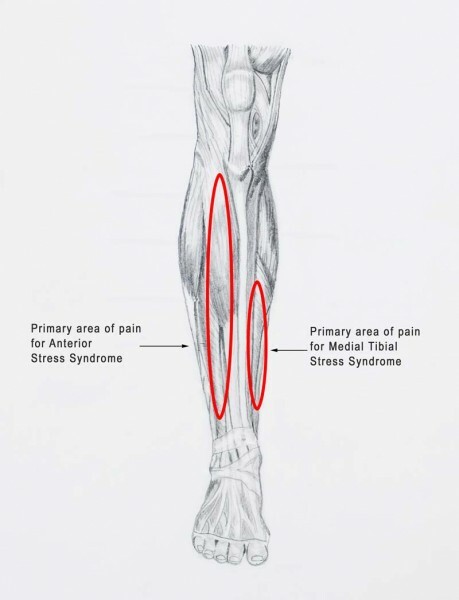 As was expected, when pressure was applied to the medial slip of the plantar fascia, at the base of the heel and at the transition into the arch, the patient reported significant pain. The patient was informed that she had a very common condition known as Plantar Fasciitis. Examination of other structures also found tenderness around both Achilles tendon. Calf range was limited, as is usually the case with Plantar Fasciitis. The patient was asked to walk on her tip toes for 30 seconds which she did, with mild pain in the heel and arch. She was asked to perform 10 heel raises while standing on both feet which she did with mild pain in the heel again. The sports podiatrist then asked her to perform single leg heel raises on the right foot. She was unable to perform a single heel raise on the sore foot due to extreme pain which forced her to stop, half way through. The sports podiatrist carried out a bio mechanical assessment and observed the patient walking bare foot on a treadmill. No abnormalities were detected. The sports podiatrist was suspicious of tearing in the plantar fascia. He arranged a referral for an ultra sound. The report came back and confirmed a deep surface tear measuring 3mm X 7mm. The patient was informed that she would be required to wear an immobilisation boot for approximately 4-6 weeks, at least. This would unload the foot, and take strain off the plantar fascia, allowing it to heel naturally. Strapping was applied to the affected foot and would continue while the boot was in place. The sports podiatrist provided the patient with a mobile phone app which included a treatment plan. This involved supinated calf stretches and the application of ice packs on a daily basis. After 4 weeks, the patient informed the sports podiatrist that she was improving. Her morning pain was still present but was less than before. There was no throbbing in bed at night and no pain while walking with the boot on. The patient was compliant with icing but not so much stretching. The stretching technique was re-enforced. Strapping was still in place and was being re applied by the patient. Further improvement was noted at the 8 week check up. The patient was advised to walk for an hour a day without the boot, if she was comfortable and able to do so. This was well tolerated during week 9, and so the patient was able to cease using the boot. She was advised to continue strapping the foot and to use functional footwear until the remaining heel pain had subsided and the Plantar Fasciitis had cleared completely. PLEASE: Do not take the information in this case study as general advice. If you have Plantar Fasciitis or any type of foot pain you would benefit from the advice of a sports podiatrist.